The number of female surgeons remains low. The number who specialize in oculofacial plastic surgery is very low. Meet Dr. Flora Levin. She’s a Westporter with a thriving practice in that field. She does cosmetic and reconstructive eyelid surgery, along with non-surgical facial rejuvenation. 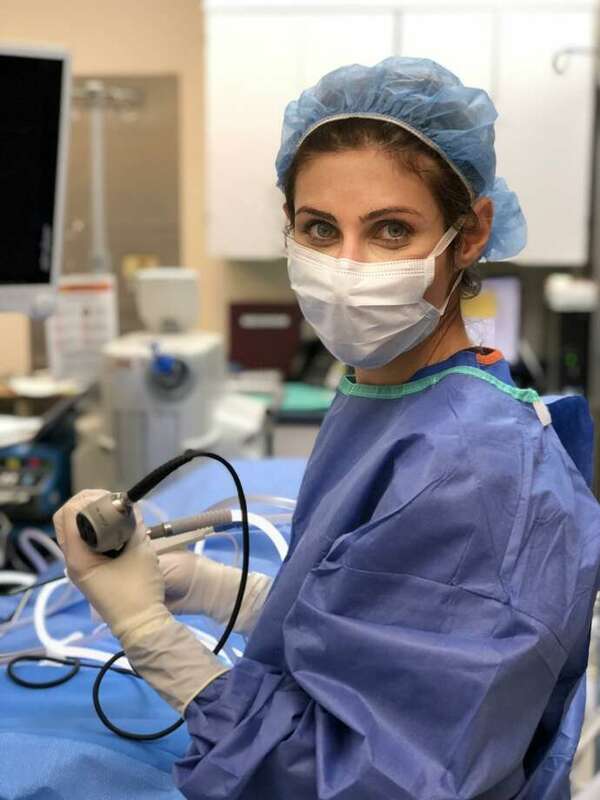 “I definitely have a surgeon’s personality: decisiveness, desire for control and order, and the expectation to figure out a definitive solution to a problem,” Levin says. That’s the “nature” part of her background. The “nurture” came from her father. He was a general surgeon. “My dad dragged me to museums from a young age,” she recalls. “So at 6 I was shown how Rembrandt used light to emphasize the subjects of his portraits.” She learned about proportions and balance, along with the story behind each painting. As a female physician, one of her biggest challenges was starting her career and her family simultaneously. She had her first child while in residency, the second in fellowship. In 2010, Levin took a position at Yale. There, she saw patients with rare and complicated conditions. One was retinoblastoma, a malignant childhood eye tumor. The first time she had to remove the eye of a young boy, her own son was just a few months old. “It’s hard to put into words the emotions I went through during that 45-minute operation,” she says. She thought about the responsibility she bore; the impact she would have on the child’s life, and the uncertainty of what tommorrow may bring for her own youngsters. Subsequent surgeries were “easier” — but the emotions never went away. A couple of years ago, she was on the other side of the relationship: a concerned mother. Their third child was born with a port-wine stain (congenital birthmark). Because of its location, there was concern of Sturge-Weber Syndrome, which can cause seizures and/or glaucoma. Within hours of her birth — on New Year’s Eve — Levin and her husband read every article from the last 10 years on PWS and SWS. Thanks to caring colleagues, who responded to calls, emails and texts on Jan. 1, the couple got appointments with top specialists in Connecticut and New York. She had heard that patients hear and retain only 30 to 40 percent of what a doctor tells them. Now — bombarded with information — she knows it’s true. Levin’s daughter is now a “beautiful 2 ½-year-old with a faint pink birthmark on her forehead and eyelid.” She has had normal eye exams, and no neurological problems.